The Prineville St. Vincent de Paul Food Bank will cease food distribution Aug. 31 and close their doors on Court Street by the end of September. "We have not been able to find anybody to support us with our operating funds," said the local St. Vincent de Paul President Jim Rodosevich. "The last eight out of eight grants that we applied for got rejected." 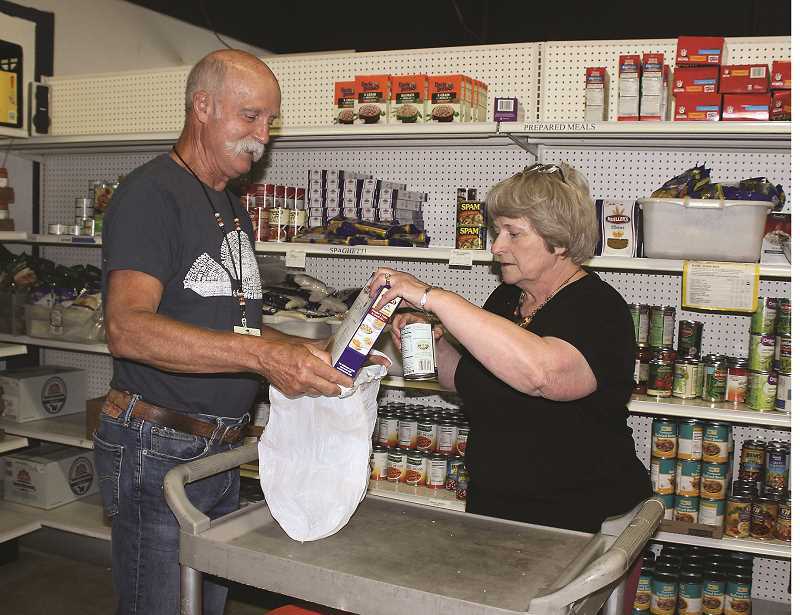 St. Vincent de Paul's Food Bank was established in 1985 to serve the poor and needy of Crook County. In 2017, the nonprofit organization provided nearly 223,000 pounds of food to 9,646 people locally. The nearly 40 volunteers gave 7,212 hours of their time and traveled 21,013 miles in their personal vehicles to physically collect, handle, sort and distribute this food. Rodosevich, who has been the volunteer president for three-and-a-half years, said the business must be financially self-sustaining. "At this point in time, we cannot sustain our operation financially." Operating funds have been generated by donors, grants and an on-site recycling operation. Additionally, organizations and individuals donate beef and vegetables, mitigating operating funds. Individual donations have supported St. Vincent de Paul at the same rate as the previous year. "Grant funding, however, has fallen flat," Rodosevich said, noting that grants have supported the day-to-day expenses of food purchase, rent, utilities, truck operating expenses, insurance, office supplies, wages, taxes and repairs. "Grants of this nature seem to be a rarity today," he said. In the past, grants have mostly come from local and statewide organizations. He said many grantors view St. Vincent de Paul as a religious organization, which they are not, and therefore reject their grant applications. Although they do have some loose association with the Catholic Church, they are a nonprofit, nondenominational organization. Secondly, grantors are much more inclined to provide grants for capital projects. "Capital projects don't pay the light bills or the rent," Rodosevich pointed out. Last fall, the St. Vincent de Paul Thrift Store closed because it was not making a profit. Volunteers and the equivalent of two paid employees run the warehouse, which opened in 2012. They have gathered, sorted and bailed more 600,000 pounds of clothing annually for recyclables sale. They gather clothing from local donations and shops, and in La Pine, Bend, John Day and Burns. One full-time and three part-time employees will be out of work when St. Vincent de Paul closes their doors on all operations by the end of September. St. Vincent will hold a clothing sale on Saturday, Aug. 25 to clear out the modular that has been a place for those less fortunate to redeem vouchers for free clothing and household items. Then, they will hold a sale Friday and Saturday, Sept. 14-15 to clear out the office supplies and operating equipment. "Proceeds from these sales will be kept in account for a future reopening of a down-sized and restructured Food Bank," Rodosevich said, adding that monetary donations will still be accepted.